Shortly after I was named Bishop of Gaylord, a small diocese in Michigan where I served from 2009 to 2013, I was part of an ongoing discussion concerning the challenges faced by newly ordained priests. The evidence suggested that far too many young priests across the country were, at times, feeling overwhelmed by loneliness and isolation in their first assignments, even though they had been happy and vibrant seminarians just a few years before. As a newly minted bishop trying to learn the ropes in a diocese that was totally foreign to me, the experience of those rookie priests resonated with me. I will be forever grateful to one of the wise old prelates who suggested that a bishop make a point of introducing the young priests in his diocese to the men in their areas responsible for teaching natural family planning consistent with the vision of “Humanae Vitae.” Those men, the bishop explained, love the Church and often invite their pastors into the life of their family, giving witness to the joy that comes from being faithful to Church teachings, the peace that comes from trusting in God’s provident care and the love that is strengthened when we put others before ourselves. Not only have I looked for opportunities to pass on that good advice, I took it to heart myself. I was inspired by the families that I met, and I came to appreciate that the spirituality of “Humanae Vitae” isn’t only for married couples, but also for widows, priests, those who never married — and even bishops. We need each other to remind ourselves of the remarkable joy that comes from humbly accepting that God has a plan for our happiness, and that he uses the teaching authority of the Church to enlighten our consciences and to reveal that plan to us, even when it might seem challenging. Like Adam and Eve, we are tempted to think that our plans are better than God’s plans, and we are foolishly surprised when placing our will before the Lord’s will sows confusion, brings heartbreak or holds us back from intensely experiencing the love that God has for each of us. I love hearing the testimony of those couples who were unaware of the teaching of “Humanae Vitae” when they were first married but come to an appreciation of that teaching later in life. They speak of the transformation that occurred in their marriages at that point. As they grew in self-knowledge, they experienced a deeper respect for themselves and their spouse, and they came to enjoy an intimacy that had previously not been known to them. What a wonderful reminder of the impact that we can have when we give witness to what happens when we put God’s plan before our own. Ask Father Joe Taphorn, the newly appointed rector of the St. Paul Seminary, and he will speak of the great joys that he has experienced in his present ministry as a pastor and chaplain at the University of Nebraska-Omaha. Seeing the fruits that the Lord was bringing to his ministry, whether in the pulpit, or on the soccer field or the late-night conversations with college students less than half his age, Father Taphorn planned to stay in that apostolate as long as his archbishop allowed him. In the weeks that followed, Father Taphorn accepted that challenge and worked with his own archbishop, his spiritual director and his trusted confidantes, and he came to the uncomfortable decision that perhaps the Lord had a plan for him other than campus ministry. He took the risk of allowing his name to be placed in consideration, was shocked when he was identified as one of the three finalists for the position (all three were excellent, by the way), and yet was surprisingly serene when he learned that he was being recommended to me and to the seminary’s board of trustees for appointment as the next rector. 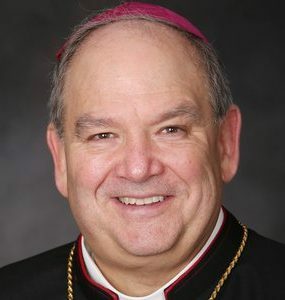 It would mean the unthinkable: leaving behind in Omaha his parents, his family, his brother priests and his flock in order to accept a position that he would have never sought. And yet, he has embraced those sacrifices with joy, motivated by the conviction that it’s part of God’s plan for him and for our seminary. I am delighted when I consider the extraordinary gifts and experiences that Father Taphorn will bring to the position (you can read about them here), and I am thrilled that our seminarians — and I — will have the benefit of a rector who day-in and day-out will be witnessing to what happens when we put God’s plan above our own. As the Lord has brought fruit to those families who have embraced his plan and opened themselves to the possibility of life, may he bring fruit to Father Taphorn and all those whom he will serve in his new ministry.